I lived from ages 2 to 11 in a bedroom community along a west-running wooded ridge. We moved there when suburban development had just begun to crowd out the farms. The entire neighborhood had been plunked down in 1961 in the middle of what had been a wooded lot on an overgrown farm. 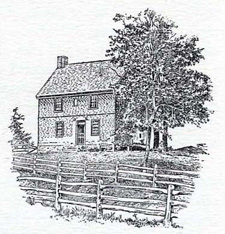 The farm had been cleared and settled in the 1730s, I learned long afterward, by a Welsh Quaker ancestor of mine named Meredith. This end of the farm sloped too steeply for the old ox-drawn plow, and the schist that cropped up like knuckles made the land unprofitable for wheat or, later, corn. But the woods were likely cleared at times, perhaps sold as charcoal wood for the lime kilns in the valley, because the trees that remained after the bulldozers did their work and we moved in were not more than a century old. We were a tiny development, even in those years. Two parallel streets ran down a hill, without, at first, even a road to connect them at the bottom and complete the loop. Each road -- Sweet Briar and Glen Echo, names chosen from the saccharine gazetteer loved by developers everywhere -- dumped up onto Kirkland Avenue. This was an old back road up the ridge, and it connected King Road, which ran across the ridge, to Pottstown Pike, which cut through it three miles west of us. It was not, at that time, a much-used road, except by people who lived along it. Our development had maybe 20 houses when we arrived, and as many vacant lots, which gradually filled in over the years we lived there. 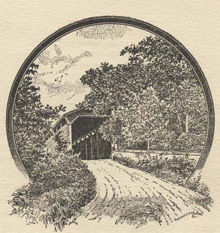 The old farmhouse still stood, along the lower end of Glen Echo, beside some ruined greenhouses and a stream with crayfish and a boggy hole that we called a frog pond and our parents called a cess pool and forbid us, in vain, to play in. The houses between the two roads backed up to one another's property lines, but on the outer ring, where our house stood, a strip of very tall trees abutted all our back yards, and beyond that about 100 acres of cornfield spread in the sun. Sometimes the lifting of the morning mist revealed deer in our backyard and ring-necked pheasants. The deer were natives, but the pheasants had been brought over in the last century by gentleman farmers looking for sport, and they lingered until developments cleared out their tall grasses and modern hay mowing techniques scythed down their young still in the nests. I believe they are all gone now east of the Brandywine. This landscape was paradise for me and the other kids on our block, for almost every house was owned by a young couple and had two or three children. We played in each other's homes, but mostly we played out in the yards that ran together without fences, or in the woods behind them, or in the cornfield beyond that. The cornfield in July was a hide-and-seek heaven, and blackberry vines grew on the rock outcrops and the vines in the woods in October had gourds that dried and rattled if you stashed them under your bed all winter. The hill was a perfect slope for sledding, garter snakes lurked under most of the garages, and every once in a while some lucky kid turned up an arrowhead while kicking through clods in the plowed field. We straggled inside at dusk, stained with berry juice or musty with corn dust. Always muddy, anyhow. I am sure I remember certain glades in the farther woods that, like Brigadoon, could only be found on magic days, or when your childhood mood was alert to them. I am sure I have seen, many times, a tree stump that was a dark blue-black, eight feet high and as wide as a boxing ring. When I became an adult I doubted that memory, until I befriended Robin and Karen Reynolds, who had a feed store in the old Embreeville Mill, and there I saw a single beam of chestnut that ran the length of that building and held it all up, and realized it would have left a stump like the one from my childhood. Sturdy, unkillable monkeys that we were, we swung from vines over ravines and got lost for hours in the corn, and walked over thin ice and never got worse than poison ivy. Even the new houses going up, and the new roads that brought more new houses, seemed part of the paradise that the gods of childhood had ordained for us. We burrowed in the sand piles and scaled the road graders like huge toys. We made leaf forts and tree forts. We caught a collective madness for three weeks and dug for oil, in the cornfield, and when we gave that up the Rogers kids enlisted all of us to steal plywood from the building sites and we made the world's best tree fort. For a while our lives revolved around one tree, a black oak that stood along the side of my best friend Billy Storey's back yard. Actually it might have been in the neighboring Hartzel yard, and the three Hartzel girls came out periodically to scold us out of their tree, but we made faces at them and they went away. This was all done in the way of childhood. No one ever said, "Let's climb the tree." Kids just started doing it every afternoon when it wasn't pouring down rain. We came home from school, shed bookbags, said, "Hi, mom," and shot out the back door and up that tree. Every kid had a branch: his own branch. It marked the juncture of how high you weren't afraid to climb and how low you weren't ashamed to stop. My branch was neither the highest nor the lowest. Billy's was one of the highest that a kid had reached. All were fairly close to each other and not more than 30 feet off the ground. We sat there like a pack of lemurs and talked about whatever it is kids talked about -- whether dry ice was real and if it would burn you to touch it. Whether God was real. What was the best TV show. One afternoon Billy and I went into the tree alone; I don't remember why. We started climbing and didn't stop. We found footholds we hadn't noticed, and got well up into the branches. A bear was rumored to live at the top of the tree. The Big Kids had invented the story to scare the Little Kids then started to believe it themselves. But he wasn't there. We weren't afraid. We didn't talk about what we were doing. We climbed. We got so high we could wrap our 8-year-old arms clear around the bole of the tree. The bark here was smooth, not gnarled like it was further down, and when the breeze swayed the tree, we swayed with it. We looked up, through the crown, and saw blue sky. We looked down on the gutters of Billy's roof and spied the Superballs that had vanished when we tried to bounce them over the house. We looked out, my best friend and I, as saw the sun's light spread over what must have been the whole world. There were bigger trees than ours out there, their trunks lost in autumn haze, and there were bright clearings we had never seen and wouldn't know how to find on the ground. Our mothers would have grounded us for a week if they could have seen us cling like sailors to a mast 150 feet off the ground. Billy and I rarely went into the tree after that. My family moved away three years later. The last I heard of Billy he had become an engineer, but that was 15 years ago. The Little Kids kept at the tree for a while, then they, too, found something else to do. � 1999 Douglas Harper Moe: "Say, what's a good word for scrutiny?" Shemp: "uh ... SCRUTINY!"